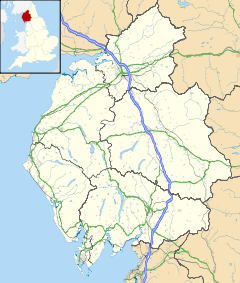 Kirkbride is a village and civil parish in Cumbria in the north west of England. The civil parish population at the 2011 census was 489. Significant remains of ancient history are close to Kirkbride including the Kirkbride Roman fort and Hadrian's Wall some miles to the north. Hadrian's Wall in this western reach and the Kirkbride fort were originally of turf and timber construction due to the paucity of available stone in this part of England around the Solway Plain; the Wall was later rebuilt in stone. The earliest recorded history of Kirkbride derives from the Roman occupation period; in 122 AD, the Romans constructed Hadrian's Wall, which incorporated the Vallum earthwork, and was initially made chiefly of turf and timber in the western reaches such as near Kirkbride. It is thought that Kirkbride Fort predates Hadrian's Wall and was built as part of the Stanegate frontier. The Wall was designed primarily to prevent entrance by small bands of raiders or unwanted immigration from the north, not as a fighting line for a major invasion according to Stephen Johnson. LIDAR photography has proved the existence of a Roman road linking Kirkbride Roman fort with the nearby fort of Coggabata at Drumburgh to the north-east. Hangar at former RAF Kirkbride, Cumbria. ^ "Parish population 2011". Retrieved 19 June 2015. This page was last edited on 9 March 2019, at 02:26 (UTC).